“An object may look red for a while, like the Parthenon in the dying rays of the sun”. The Parthenon – a temple erected on the Acropolis of Athens, dedicated to the goddess Athena Parthenos, or Athena the Virgin, patron of art and handicraft – survived nearly two and a half millennia. The structure was built of white marble harvested from the quarries of Mount Pentelicus. The Parthenon served the entire Greek world and stood as a symbol of the firmness of the state. The architects Iktinos and Callicrates designed it on a platform of three steps and a peripteral plan – as a rectangle surrounded by columns. The statues inside and around the building most probably originate from the studio of Phidias and were created by the sculptor. Three main sculptural-decorative styles can be distinguished in the architecture of ancient Greece. Each of them is based on a separate system of proportions. The Doric order is characterised by simplicity, monumental massiveness, austerity and logic of forms. Proportions in the Ionic order are lighter, while the style also manifests slender forms and a penchant for decorativeness. The Corinthian order is a variation of the Ionic order, albeit with more abundant decorations. The Parthenon is enduringly considered as the ultimate example of classic architecture. A legacy of ancient Greeks towering above modern-day Athens, a tourist destination, featured on postcards and photos adorning the fireplace, the protagonist of countless selfies and Instagram posts – it symbolises until the present day the apogee of the development of thought about art, architecture and the state, touched by the tooth of time. A similar reputation is enjoyed by the idea of Greek democracy, which – despite having suffered demise – is considered as humankind’s ultimate achievement in political thought. Nowadays, its visions are popular – as is the Parthenon – as a motif of postcards and t-shirts as well as posted on social media, where they undergo further evolutions. The decay of the Parthenon is subject of reflection pursued within Zuzanna Czebatul’s exhibition. 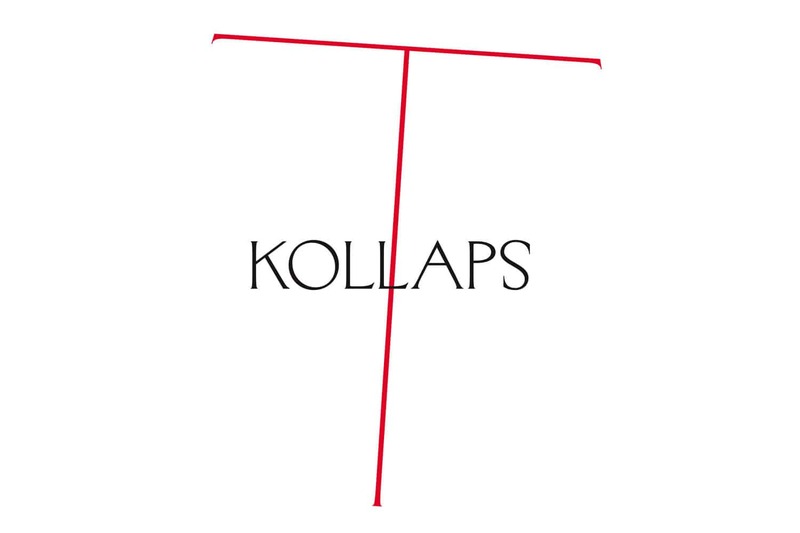 “T” stands for “temple” and “Kollaps” means “collapse”. Travellers from Europe and other corners of the world who visit the limestone hill in Athens today encounter ruins of the ancient temple complex. Likewise, the concept of democracy has changed its meanings throughout the millennia. Humankind has enjoyed ample opportunities to put its various models to test, some more successful than others. New social classes and groups, ongoing evolution interrupted by revolutions – all of this shapes the democratic regimes known today. The global idea of democracy – demos and kratos, “power of the people” – has many local variations. It is similar to the Greek orders carved in marble, which – although defined and measured – were actually assembled of spatial collages of their own selves as a result of decisions and efforts of those who created them. In her installation T-Kollaps, Zuzanna Czebatul evokes ancient canons: Doric, Corinthian and Ionic. The artist fills the interior of the gallery’s scarlet space with inflated toy-columns as if with elements of ancient ruins suffering decay. Czebatul replaces hard classic marble from Pentelicus with soft transparent and thermoplastic polyethylene, thus bringing to mind the changes that the ancient idea of the Greek state has undergone. As she disassembles the orders and uses their parts to build new structures, the components become deflated. They are now flexible and lose their shape. We are taken to a massive playground, an inflated theme park of ideas. Paradoxically enough, it was built of elements that used to make up a temple dedicated to gods worshipped by ancient Greeks. Statues of gods are nowadays monochromatically solemn, yet in their heyday they were painted with many colours. Similarly, when the red colour of the gallery walls permeates the transparent elements of Czebatul’s installation, they adopt the hues of the surroundings akin to a chamaeleon. For a brief while, we may experience the sunset over the Acropolis and witness “the Parthenon in the dying rays of the sun”. Zuzanna Czebatul was born in 1986 in Międzyrzecz. She studied at the Städelschule in Frankfurt am Main and the Universität der Künste in Berlin. Holder of Fulbright Scholarship at the Hunter College in New York and the SOMA in Mexico. Her work focusses on the medium of sculpture in order to explore the relations between aesthetic and political systems, physicality of the sculptural matter as well as popular and club culture. 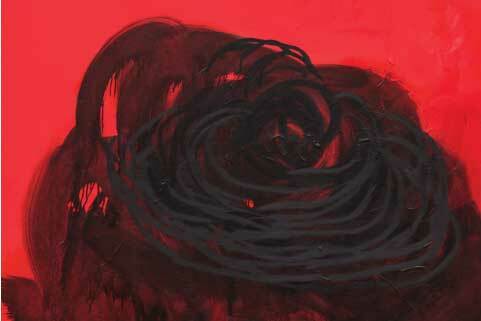 Recognised as one of the most interesting young artists in Europe by Artnet.pl. Lives and works in Berlin.